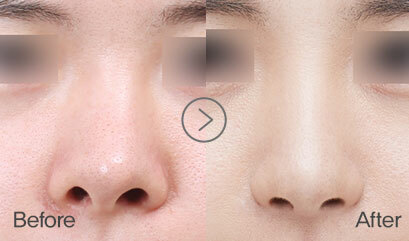 Revision rhinoplasty is a reoperation for a nose that is aesthetically or functionally unsatisfactory after surgery. Reoperation is more difficult than the first operation because the cases are very diverse and uncommon, including tissue changes and inflammation caused by the first operation. 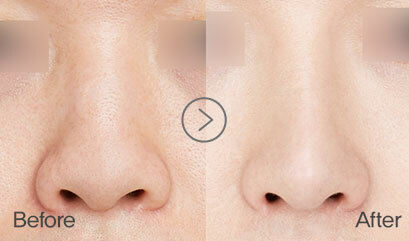 Therefore, it is necessary to have precise analysis before operation and abundant experience in nose surgery. 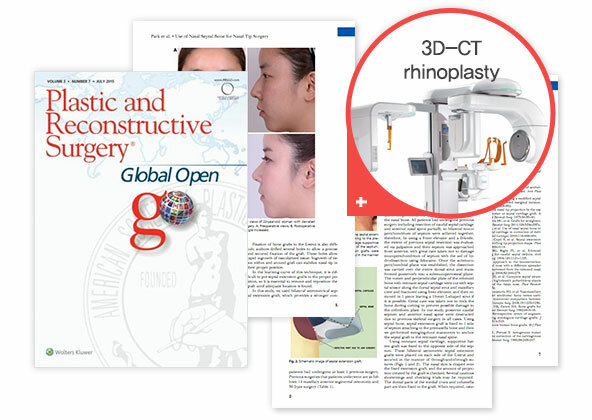 In addition, it is necessary to closely examine whether it is possible to perform systematic surgery through precise surgical know-how that can analyze both aesthetic and functional aspects at the same time. Is it possible to perform precise analysis using rid 3D-CT? 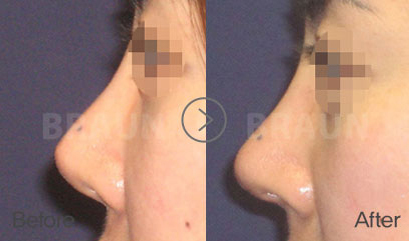 Does this clinic have experience with revision rhinoplasty? Does this clinic have surgery know-how? Does this clinic have a safety and emergency system? Inflammatory control, such as removal of implants, needs be completedfirst before reoperation for safety. Depending on the condition of the tissue or the surgery type, surgery can be performed earlier. An accurate consultation with experienced specialists should be completed first. 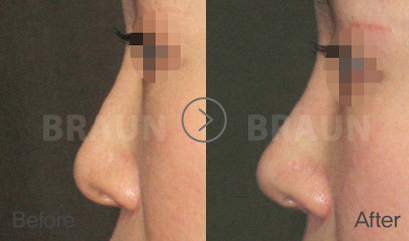 What is Braun revision rhinoplasty? 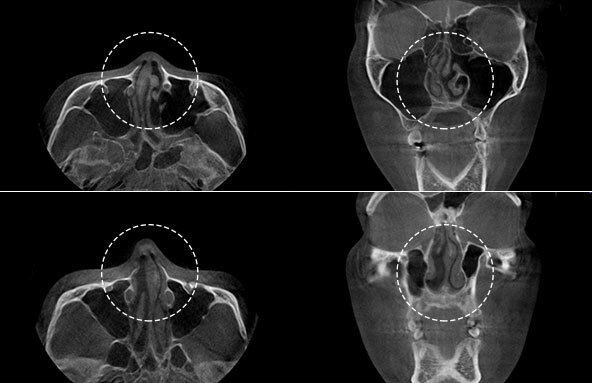 Revision rhinoplasty, you must check with 3D-CT! 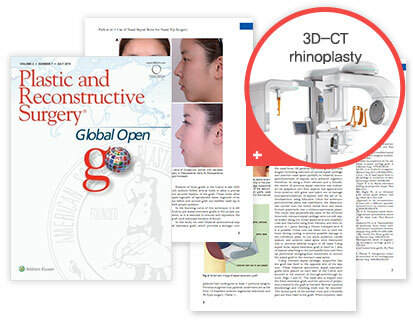 General rhinoplasty can’t confirm this information, 3D CT rhinoplasty can! Case 3. When Gore-Tex is thick, it compresses the skin. Cause : The operation was performed withan incorrect surgical plan. 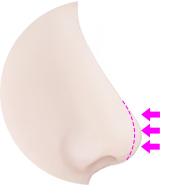 Treatment method :The best nose is design considering the proportion of the face, and skin condition through sufficient consultation. 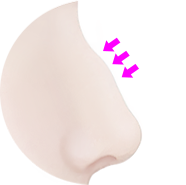 Cause : In the previous procedure, a structure that can serve as a strong support to the tip of the nose was not created, so the nose tip is falling or sags over time. 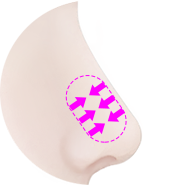 Treatment method :By using cartilage, make a structure that can act as a soft and strong support on the nose tip and keep its shape. 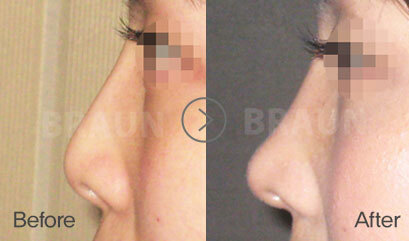 Cause : It is the case where the operation was performed without a beautiful nose angle for the face. 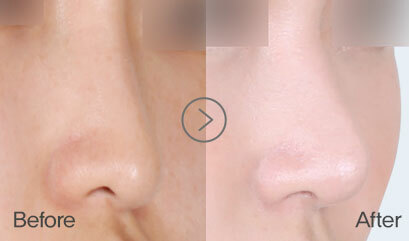 It is no exaggeration to say that this is the most important part of nose surgery. 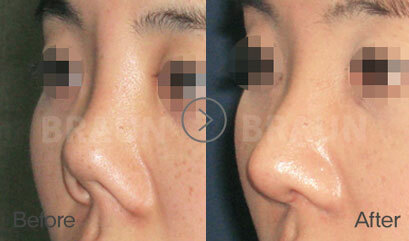 Treatment method :It is important to harmonize with the face and make an angle with it. It is best to remove the existing nasal cartilage and adjust the angle by using a new cartilage implant. 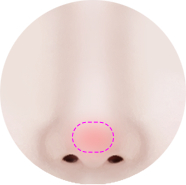 Cause : It can occur when the height of the nose was not sufficient, the subcutaneous fat at the tip of the nose was not removed properly, or when too much cartilage was used. 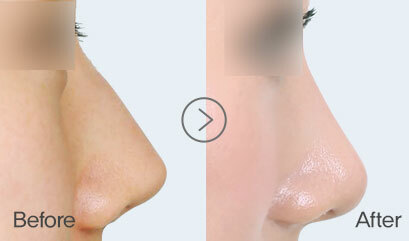 5.When side of the nose or a part of the nasal bridge is dented and uneven. 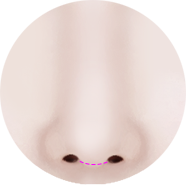 Cause : It is a case where the implant was inserted on the nose end,too much skin was removed,or the skin asymmetry on both sides of the nose was not corrected. 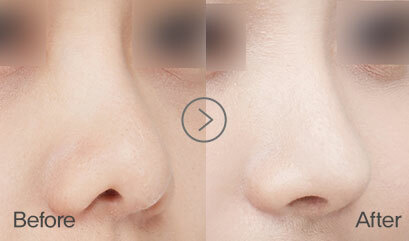 Treatment method :It is better to use silicone of appropriate thickness only for the nasal bridge. You can correct the dent or asymmetry of soft tissues including skin by using cartilage, autologous dermis (deep skin) and artificial dermis. Cause : Sometimes there is a case where the surgery was performed while overlooking asymmetry of the facial skeleton or imbalance of soft tissue strength. 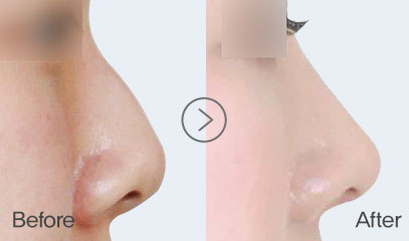 There are also many cases where the deviated nasal septal cartilage in the nose was not corrected or the asymmetry of the skin thickness around the nose was corrected before the surgery. 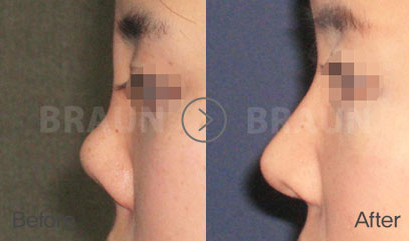 In addition, the implant may be too high and too long,so the pressure causes the nasal bridge to bend. 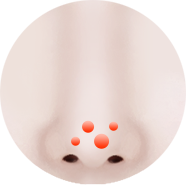 Treatment method :It is important to grasp precisely the asymmetry of the facial skeleton and soft tissue before operation and to placecartilage in the nose while correctingdeviated nasal septum or nasal bones. You should also use implants of appropriate height and length to fit your skin. 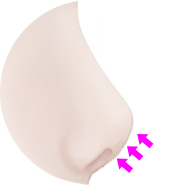 Cause : This is a common side effect that can occur as skin gets thinnerwhen the implantwas used up to the tip of the nose (regardless of covering the cartilage on the implant) or when the nasal tip was raised without consideration of the skin condition. 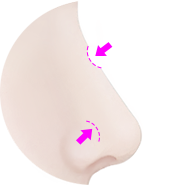 Treatment method :When the thickness of the skin is good, the surgery can be performed using general cartilage with proper height adjustment. However, when the skin is thinned, the thin nose tip skin is supplemented using autologous dermal fat tissue, temporalis fascia, artificial dermis. Cause : When the implant is pressed due toits height or width that does not fit the skin, the skin is too thin, or the patient has an allergy to the implant. Treatment method :You can change the implant to another type or cover the autologous dermis or artificial dermis on the implant. Or you can remove the implant and fix it with autologous cartilage, autologous dermis, or artificial dermis without an implant. 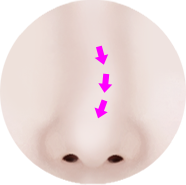 Cause : When the surgery didn’t correct the aquiline nose enough, it still remains or comes back. 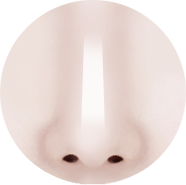 When the aquiline nose was corrected too much, it can cause a dent. 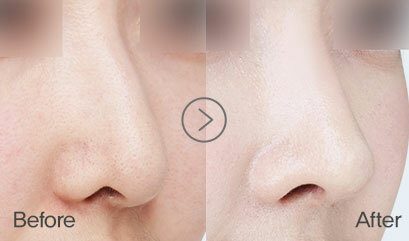 Treatment method :When the aquiline nose came back or you still have an aquiline nose after the surgery, additional surgery can fix it easily. When there is a dent, cartilage can be used to supplement the sunken area. 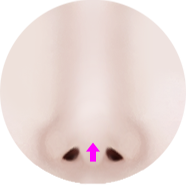 Cause : When the primary surgery didn’t shave off enough of the nasal bone, or the skin itself is thick or spread out. 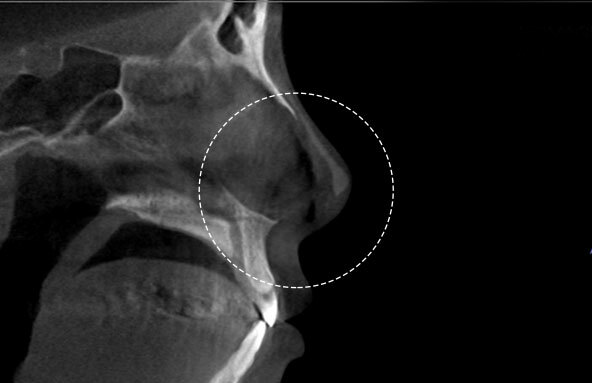 Treatment method :It can be solved by more precise nasal bone osteotomy or by shaving off more. When the soft tissues or cartilage are wide, remove or shave them properly. 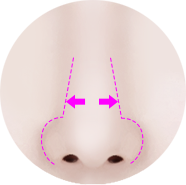 The wide side of the nose can be reduced by securing the proper height of the nose and reducing the side of the nose. 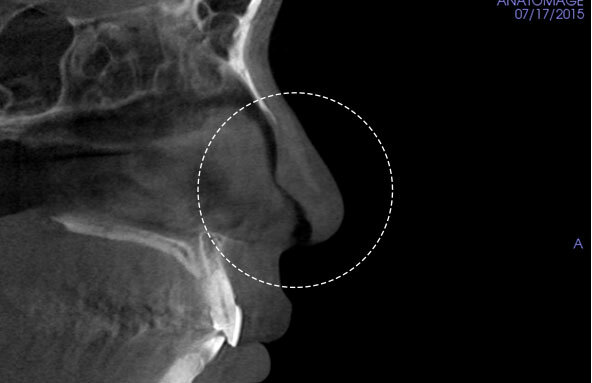 Cause : This can happen when the implant is high, the width does not fit the contours of the nasal bone, or the skin is thin. Treatment method :It can be fixed by lowering the height of the thicker implant or inserting an implant that fits the contour of the nasal bone. 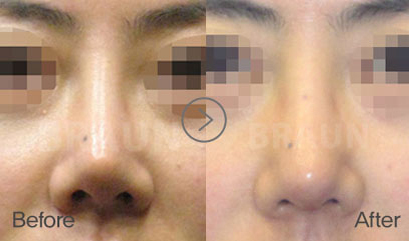 When the skin is thin, the artificial dermis or the temporalis fascia is expanded to cover the implant like a blanket. Cause : Allergies or infections may occasionally occur for several reasons, but this is not a common side effect. Typically, inflammation or allergic reactions to silicone or Gore-Tex are between 1.7% and 2%. Treatment method :It can be resolved by changing the implant to another type or by using autologous costal cartilage, donated costal cartilage, nasal septal cartilage, ear cartilage, autologous dermis, or artificial dermis instead of an implant. 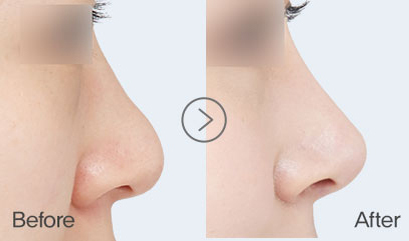 Above all, it is important to have accurate consultation with a professional who has abundant rhinoplasty experience. Cause : In many cases, contracture progressed continuously. 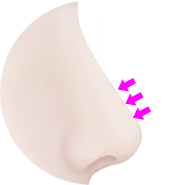 The nose tip may be lifted up when the nose tip was fixed inadequately or continuously inflamed. 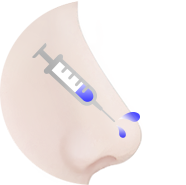 Treatment method :It completely removes the adherence of the subcutaneous damaged tissue and lowers upturned skin and the nasal septum, autologous costal cartilage or donated costal cartilage are used to effectively support the nasal tip. 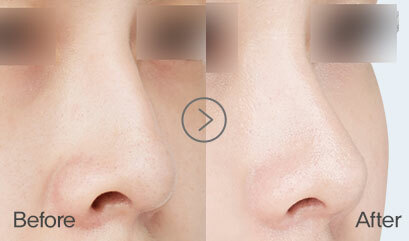 This allows you to maintain a beautiful nose tip shape without recurrence. 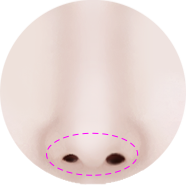 Cause : This can happenwhen there was asymmetry before surgery, when the nasal septum and cartilage balance is broken by surgery, or cartilage on therounded sides of the nose is severely damaged or cut. Treatment method :After reviewing preoperative photographs, if the asymmetry occurred from the surgery, it correctsthe balance of nasal septum and side cartilage through accurate and balanced cartilage transplantation. 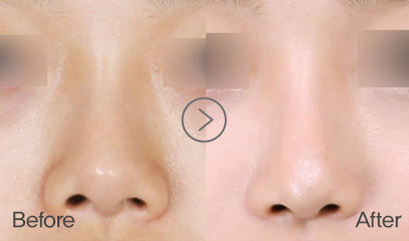 When the rounded sides of the nose are distorted, it is supplementedusing ear cartilage or nasal septal cartilage. 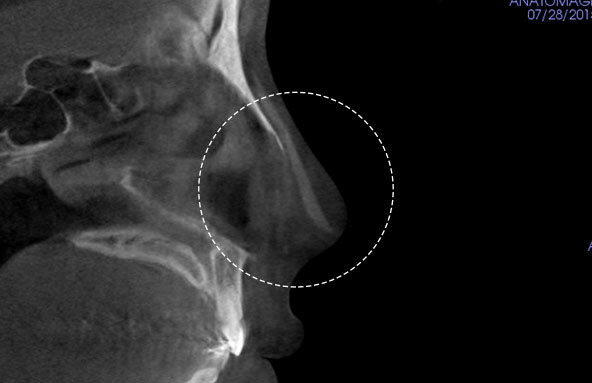 Cause : This can happen when the nasal mucosa is swollen and the cartilage is thick and protruding after the previous operation, the inferior nasal concha located on the outer wall of the nasal cavity is swollen to compensate for nasal turbinate, adeviated nasal septum is not corrected, the nasal septum is bent after cartilage transplantation, or adhesion between the medial wall on the inner side and the outer wall occurs. 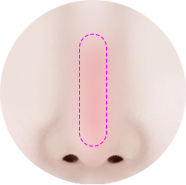 Treatment method :It is important to transplant cartilage of appropriate thickness with deviated nasal septum correction. 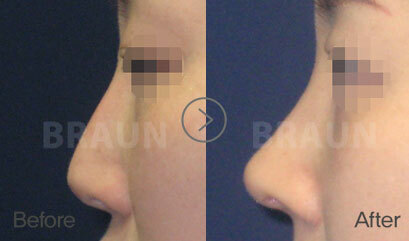 Adeviated nasal septum needs to be corrected as straightly as possible and with a proper width. 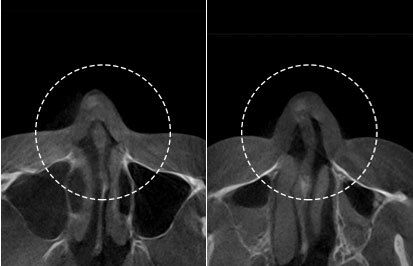 Better results can be achieved with a variety of approaches, including inferior nasal concha reduction and removal of adhesion. 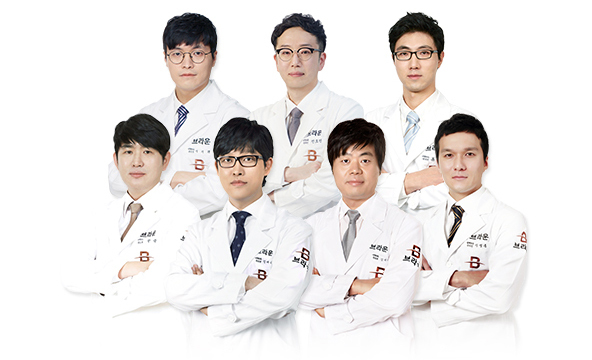 Consultation with experienced specialists and accurate access are most important after 3D-CT consultation. Cause : This is a hypertrophic scar where the incision scarfrom the previous surgery protrudes, or the implanted cartilage protrudes. Treatment method :When reoperation is done, remove the damaged area or remove the existing irregularly implanted cartilage and transplant new cartilage. 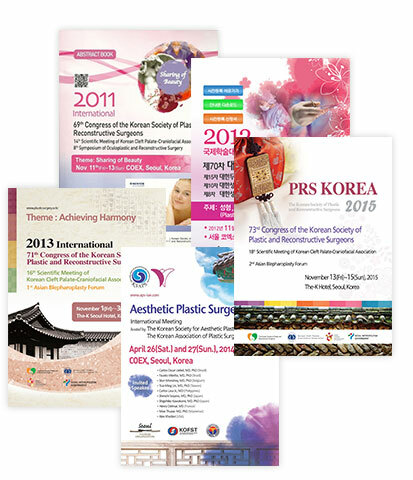 Cause : Silicone or paraffin injections, usually by non-medical personnel, can cause serious skin problems such as inflammation, skin discoloration, tissue necrosis, and the dribbling of foreign substances. Treatment method :First, inflammation treatment should be completed. 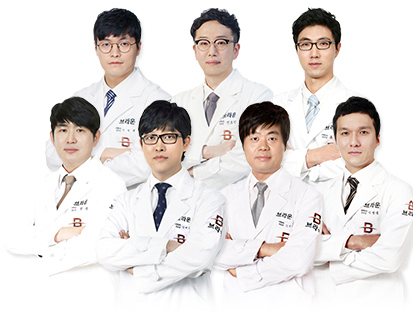 However, since the inflammation persists unless the injection is removed by direct surgery, it is advisable to remove the foreign body inserted after treatingthe inflammation to a certain degree. 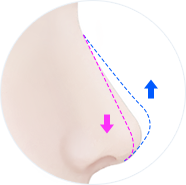 Thenrhinoplasty using autologous tissue without an implant is recommended. 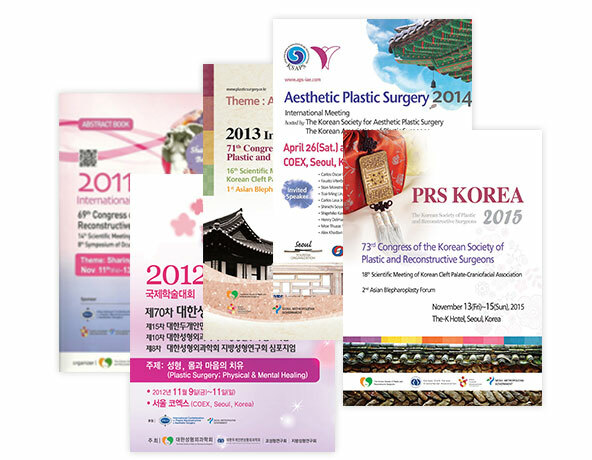 Accurate consultation and examination with a wealth of experienced specialists is important. you must check with 3D-CT!